Sausage with Peppers and Onions | Om nom nom! Using a large pan that has a lid, spray the pan with cooking spray and heat medium or medium-low. Add the sausages and brown them slowly. You want a gentle browning, not a sear. It took about 15 on our stove, be sure to turn them occasionally so they brown on all sides. 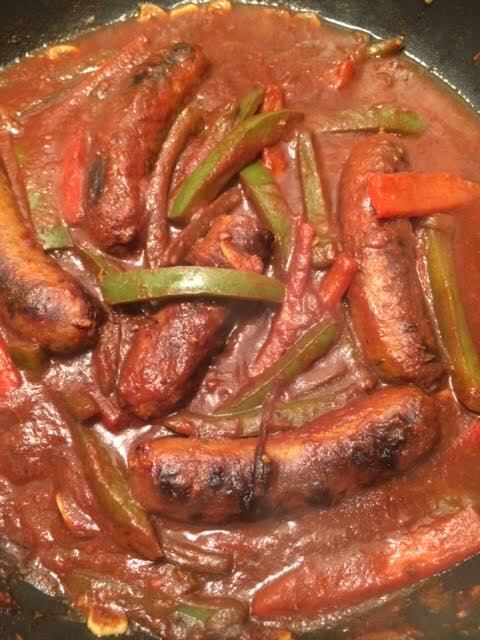 When the sausages are browned, remove from the pan and set aside. Increase the heat to high and add the onions and peppers. Toss so they get coated with the oil in the pan and sear them as well as you can, stirring every so often. You want some blackening. Once the onions and peppers soften, sprinkle some salt on them. Once you get some searing on the onions and peppers, add the garlic and cook for a minute or so more. Add the wine and scrape the bottom of the pan to release all the browned and blackened bits. Let the wine cook down by half. Add the tomatoes, oregano and red pepper flakes and stir well to combine. Return the sausage to the pain, bring to a simmer, then reduce the heat to low. Cover and simmer until the peppers are soft the sausages are cooked through, about 20 minutes.